Once upon a time, before the days of yoga pants and velor track suits, air travel was a black tie affair. We're talking suits, gloves, heels, the whole nine yards. Think about it: you are literally flying through the air like a bird. Excuse us for feeling like occassion-wear is not exactly inappropriate while you partake in the miracle of human flight. Now, Delta Air Lines is trying to bring a little bit of that glamour back with the introduction of a shiny new aircraft, ready to make its official debut this January. The Airbus A220-100, which was unveiled during a ceremony at the Hartsfield-Jackson Atlanta International Airport this week, is the first newly designed, single-aisle airliner that will grace the skies over the United States in nearly three decades. And this little number is only the first in a roster of 75 different A220s that Delta plans to introduce to its fleet over the next three years, according to a report by CNN. The new-fangled plane, which Delta describes as "experience-rich for customers," is intended to offer travelers the luxury of international travel, but on domestic journeys. Costing a mere $81 million, the aircraft is the first sing-aisle vehicle to come equipped with non-metal wings and electric breaks, which means less turbulence, and smoother landings. 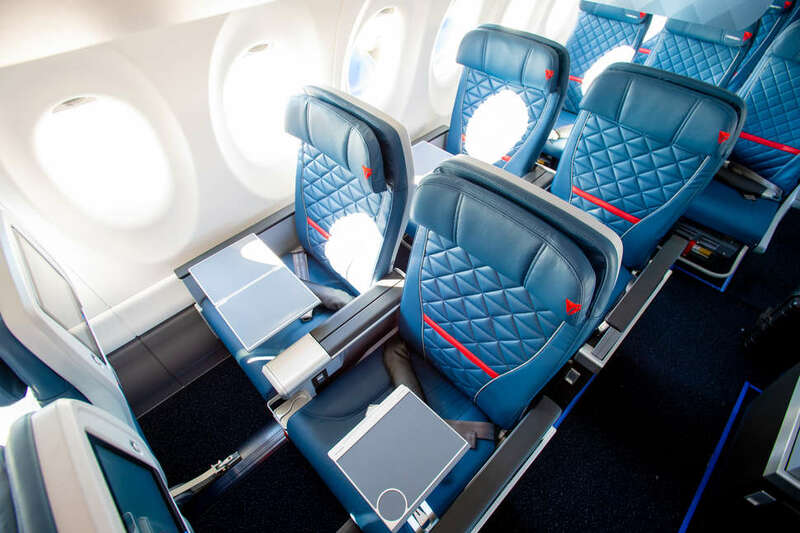 The thing is far more spacious than your typical airliner with 7-foot ceilings and 109 seats, each of which is substantially wider, and offers far more legroom than any previous Delta plane. Narrow indentations have been built into the walls in order to give folks in window seats a little more shoulder space, and the entre cabin offers LED spectrum lighting, allowing crew members to alter the color and brightness of the lights in response to various moods or times of day. 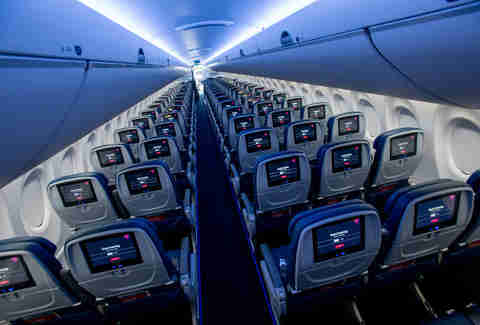 Beyond the television screens installed in each and every seat-back, the in-flight entertainment system will also come equipped with 2Ku satellite Wi-Fi, which is reportedly the fastest in the entire fleet. There will be a whole new slew of games, and the library of movies and television shows will be the largest yet, so you won't have to watch Wedding Crashers for the 47th time. 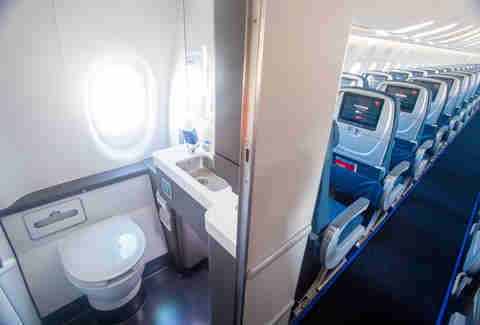 And speaking of in-flight entertainment, this will be the first-ever airplane to offer a restroom with a window -- so when you're peeing, or perhaps joining the mile-high club, you can gaze out over a scenic expanse of clouds. The jet can manage almost 3,400 miles in the air, so Delta hopes to use it for direct routes to cities that don’t typically fill up larger planes. If you're planning on flying from New York to Dallas-Fort Worth in the near future, Delta will now have you covered. And in addition to all that, the A220 is 20% more fuel efficient than most jets of a similar size, so Delta will save money on fuel, and refrain from adding excess poison to our air. Always a perk. According to the International Air Transport Association, worldwide air passenger traffic exceeded 4 billion for the first ever this year, which is 7.3% more people than in 2016. And those number are expected to continue to rise at this rate. Airlines are looking to find a way to meet that need, and Delta seems to be leading the charge. Plus, the whole restroom-with-a-view is a pretty major selling point.